Finds continue to be made in the Charlton Close/Station Road area of the village. New fragments of pottery and other artefacts being exposed as a result of the long periods of torrential rain in January, 2014. Part of a seax blade? This is derived from the border of my own garden. 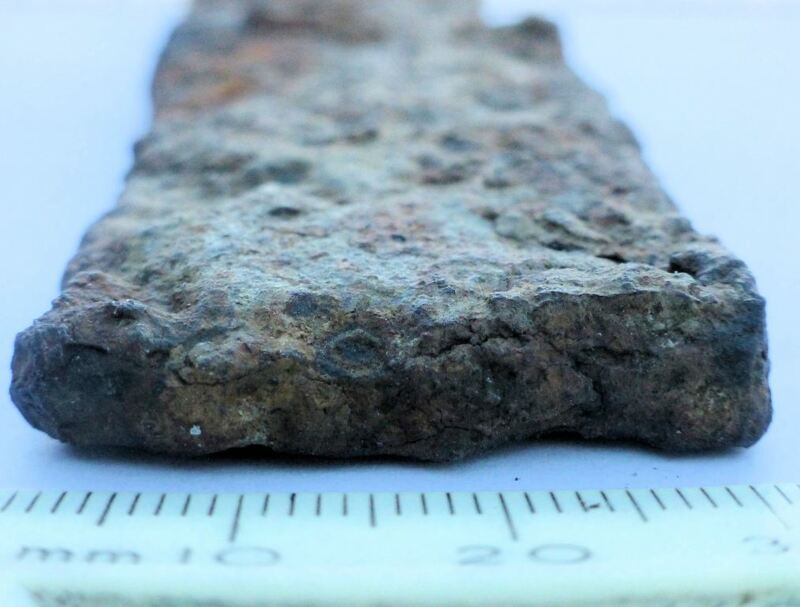 Although this will require x-ray analysis at a university archaeology department to confirm the identification for sure, it does appear to be the corroded central section of an anglo-saxon seax. Probable seax find; January 2014,Charlton Close, Swanbourne, showing remnant dimple structures from forging. 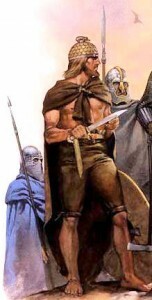 A seax is a large hunting knife (also used in conflict) which was typically used by the Saxons, and indeed, the very name Saxon is derived from their preference for the seax. They were in greatest use between about 500AD to 800AD, so this might push back the confirmed age of the original Anglo-Saxon settlement. The seax can vary a lot in length, some being as long as a small sword. Some would originally have blades on both sides, some only on one side. The manufacture of a seax involved taking several twisted rods of iron (rectangular in section) and forging them together. 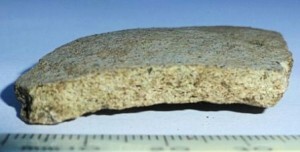 Hence the structure in a broken section may appear to have remnant rod shapes. Mercian warrior with a seax. On the one found, the rod shapes are seen, but original blade edge is corroded away. 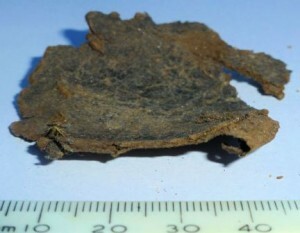 Corrosion also leaves circular impressions left from the forging process. All these tell-tale signs are seen in the Charlton Close find. 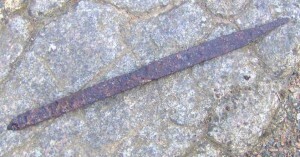 If a comparison is made with a confirmed seax of this type previously found from southern England, the overall shape becomes clear. 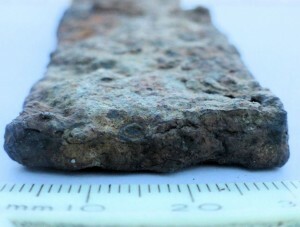 Probable central section of a seax, end-on, along a broken edge, found in Charlton Close, betrays structure made of forged iron rods. 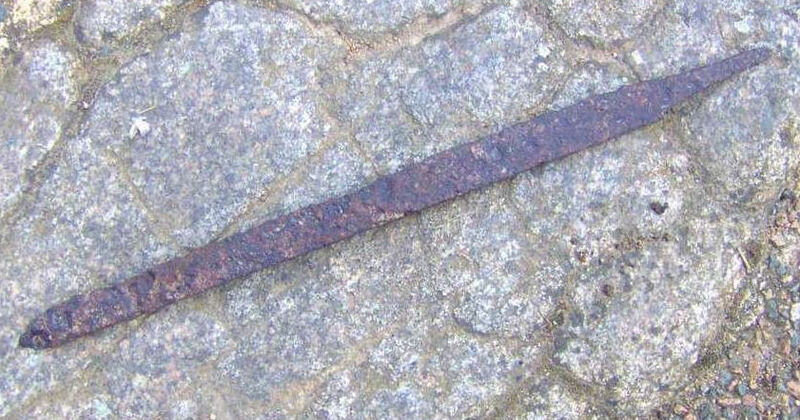 A whole seax, of the type found in Essex, for comparison. Stamfordware is the first home-produced British medieval glazed ware. It ranges in colour from whitish to pinkish-buff or pale grey, and may have a translucent glaze preserved. It takes its name from Stamford in Lincolnshire, becoming common after 900AD. Degraded leather fragments (probably fragments of Victorian shoes) have been found, as have more fragments of clay pipes, including part of a pipe bowl. Clay pipe fragments reconstructed; 16th to 19th centuries in age. 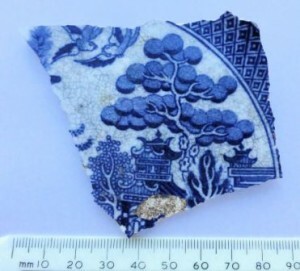 19th century willow pattern finds are probably the most common archaeological finds in Swanbourne. They look nice, but are of little value. 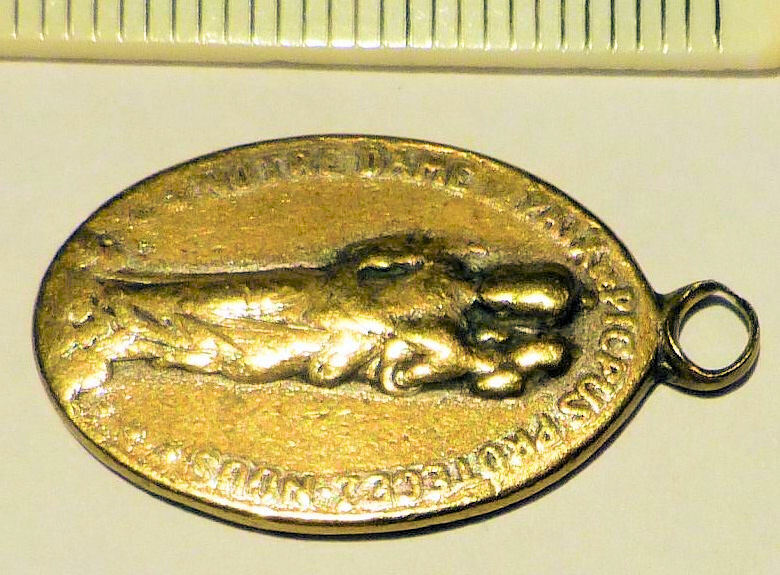 Medallion find could be Victorian to mid-20th Century. “Picpus Cemetery, on the eastern side of Paris, is off the beaten tourist track, but well worth a visit. It is the only private cemetery in Paris and quite small in size compared with the other (public) cemeteries in Paris; what it lacks in size it has abundantly in historical importance and bittersweet memories. For this is where 1306 persons from various social backgrounds , who were executed by guillotine in July 1794, at the Place du Trone (as it was then known, now known as Place de la Nation) were thrown under cover of night into two mass graves, at the bottom of a garden requisitioned from a former Convent. Relatives of the victims secretly bought the area containing the two mass graves and subsequently adjoining lots as well, building a chapel for meditation and prayer. These families, some of them belonging to the French aristocracy (eg. the family of General LaFayette), use this cemetery for their family burials to this day. The two mass graves remain at the bottom of the garden, marked by a cross. The chapel contains a complete list of victims. The gate, through which cartloads of victims of the guillotine were brought to be dumped into the two pits, could also be seen. To reach Picpus Cemetery (closed on Monday, open other days 2-6 pm), take Metro Line 1 , direction Nation and get off at Station Picpus . From there it is a short walk to the cemetery, which is at 35 Rue de Picpus. A leaflet / map of the cemetery is available at the entrance for a small payment. 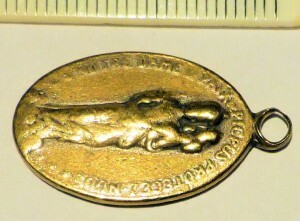 The colour of the medallion is gold, and primary gold content is confirmed by various tests. The specific gravity is too high to be brass. There is no tarnishing or green colour which occurs on brass left in the air or buried. It is softer that a steel pin and when drawing on the back of an unglazed tile it leaves a gold colour. Brass leaves a black colour. It is non-magnetic. Hence, it passes the standard mineralogical tests for gold or a gold alloy. The find was made before Christmas in the Station Road bank, not far from where previously I had found a Great Western Railway employee brass button. Perhaps, years ago, a pendant chain came loose when somebody was walking towards the rail station, got buried in mud at the edge of the bank and has been there ever since…..until now.